EZ Exit Lighting Kit is offered as an add-on to conventional exit signs, lighting a path to safety using add-on linear LEDs lights integrated into existing T-grid ceilings. The HotSpot EZ Exit EM T-grid kits are available in 24-inch (FHEZ10A24) and 48-inch (FHEZ17A48) form factors. The EZ Exit kits are designed to fit into any conventional T-grid ceiling, either as a retrofit or part of new construction. Both LED units are equipped with a HotSpot constant power driver that delivers 90 minutes of emergency power after a 24-hour charge time. The EZ Exit 24-inch unit has 10.7W of emergency output, delivering 1,480 lumens, and the 48-inch unit has a 17W output in emergency mode with 2,485 lumens. The EZ Exit units have universal mounting that is compatible with any type of T-grid fixture and both offer a universal input of 120-277VAC. 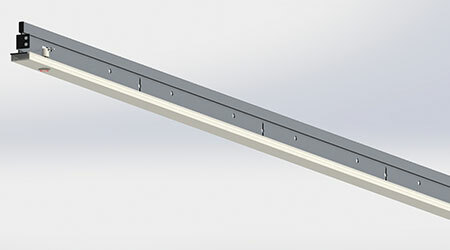 The EZ Exit seamlessly fits into any T-Grid ceiling, providing emergency light in a sleek hidden design. The EZ Exit units come with an integrated test switch and carry a five-year manufacturer warranty.